Spoilers for Ravnica Allegiance are in the books and prerelease weekend is here. In case you missed it last week, I provided an early reaction to Ravnica Allegiance spoilers from the EDH perspective. To recap my hot take, I believe Teysa Karlov will generate the most Ravnica Allegiance EDH interest over time, while Prime Speaker Vannifar will firmly hold second-place. I’m calling this a “hot-take” because the hype has definitely favored Vannifar so far, but I personally believe a lot of that is because of the combo/tool-box potential. Vannifar doesn’t leave a whole lot of room to brew; once the most consistent lines of play to win are identified and refined, the Vannifar-99 will become fairly static. Teysa, on the other hand, has injected new life into the Orzhov crowd which I believe will become clearer to the community once Vannifar hype fades. That all said, it is obvious that both new commanders will continue to push relevant card prices higher. If you look back on last week’s article, most of the calls I mentioned in there have either spiked (see: Scryb Ranger) or at a minimum risen by 10-20% (see: Black Market). Rakdos, the Showstopper and Judith, the Scourge Diva might be asking this question to the community. I know I am. The Rakdos guild is another underplayed color combination in EDH currently; outside of Rakdos, Lord of Riots, no other general in the Rakdos color pairing cracks 1,000 decks on EDHREC. This stat not only highlights the lack of good Rakdos generals printed to date, but the opportunity Rakdos, the Showstopper and Judith, the Scourge Diva have in front of them. Like Orzhov with Teysa Karlov, my expectation is for Rakdos, the Showstopper and Judith, the Scourge Diva to make an impact for Rakdos-guild lovers in the EDH community. This should catalyze some brewing, but I don’t think they will do enough to make Rakdos more relevant in the long-run. Rakdos or Judith: who will be more popular? 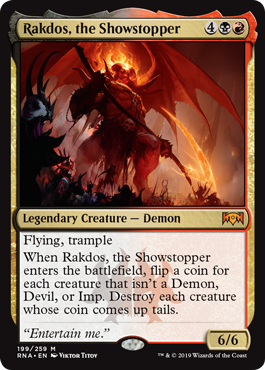 My prediction here is that Rakdos, the Showstopper will be the more “included” card in EDH decks overall because of its potential to be a one-sided board wipe on a stick, particularly for players already running a Kaalia of the Vast Demons build. 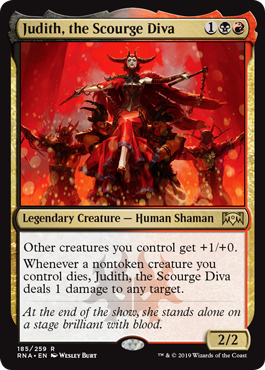 That said, I am convinced the better EDH general will be Judith, the Scourge Diva. Judith’s ability to function as the wincon for a deck is what intrigues me the most. Things like Nim Deathmantle, Ashnod’s Altar, Phyrexian Altar, and maybe even Krark-Clan Ironworks can function as engines to infinitely recur cards and trigger Judith, the Scourge Diva for damage. Meanwhile, cards like Gravecrawler, Wurmcoil Engine, Murderous Redcap, and Myr Battleshaper come to mind as the targets to be sacrificed. In addition to the possibility of comboing off, Judith’s other ability is nothing to scoff at. In a “go-wide” EDH strategy that leverages Zombies or Goblins, for example, the +1 to power can add up very quickly. This aspect of Judith makes me think it could be decent in a 1v1 setting similar to other aggro decks (see: Najeela, the Blade-Blossom), but I find it highly unlikely Judith will even be Tier 2 for EDH purposes. When I think of brewing around Judith, my mind wanders toward two separate strategies: aggro (Goblins and/or Zombies), and Aristocrats. But I can’t envision a way to synergize them the same way I can with Teysa Karlov. This is the main weakness I would point to as supporting evidence for why I don’t think Judith, the Scourge Diva will make a meaningful dent in the EDH community’s current Rakdos representation. I spent time on Judith, the Scourge Diva, but how cool is it that we get a new Rakdos to add to the collection of Demons!? I was a little disappointed that Rakdos, the Showstopper didn’t have a lord ability built in for Demon tribal, but the ETB could be a very fun casual card to build around. Digging into a few specs for the week, I like the following two cards quite a bit in response to Judith, the Scourge Diva and Teysa Karlov. For a reminder, here is the scale I’ll be using to rate my conviction in the spec’s potential. You can read more about this scale here. Rise of the Dark Realms is a single-print mythic approaching the 10K mark on EDHREC, yet the foil multiplier is currently under 2x. It sees play in all sorts of EDH strategies, and you could make the case that it should be included in almost every deck that runs swamps. The recent spoilers of Judith and Teysa should only further the cause for RotDR to get to 10K in 2019. If it dodges a reprint (particularly in Core Set 2020), the new surge in demand will almost certainly favor a price-correction, especially on the seemingly underpriced foils. By my estimate, the foil multiplier for a card like Rise of the Dark Realms should be at least 2x. That means there is about $6-8 worth of immediate upside on any NM foil copy found at $20 (only a few are out there at the time of this writing). I am predicting this card makes it to $18 in non-foil and $35 in foil by summer, but will be watching Core Set 2020 closely to make sure it dodges a reprint. I’m less concerned with the possibility of a Commander reprint as I will be focusing on foils, but be mindful of that later this year as well if you pick up non-foils. I personally acquired one single foil copy (NM) for $19.99 with the intention of using it (either in a Teysa or Dragons brew). Yahenni, Undying Partisan is the type of card that I get nervous calling as a spec because it comes from such a largely opened set (Aether Revolt). I am obviously going to focus on foils here, but Yahenni’s name itself (Undying) makes me also worry about the possibility of a quick reprint in a supplement set. That all said, foils of Yahenni, Undying Partisan have already moved about $0.75 from $2-3 since Judith, the Scourge Diva and Teysa Karlov were spoiled. The stock looks to be about six pages long (for foils) on TCGplayer, and ChannelFireball has 50 listed currently, so there is a lot of supply to get through. That all said, I like Yahenni, Undying Partisan more as a card to buy now if you need one than as a card to pickup a stack of expecting it to double. It is in a very healthy 6,800 EDHREC decks already. Its abilities are potent enough that I could even imagine a world where it becomes a piece in some type of Tier 2 aristocrats deck in Modern with Judith (though please don’t bank on this as a reason to buy!). I grabbed a single NM foil copy for $2 during spoiler season with the intention of actually using it, and I think that’ll be the only one I pick up at this time. I’m not as confident recommending Yahenni, Undying Partisan foils at $3, but I don’t see it getting any cheaper, so might be worth grabbing a single copy if you know you are going to play with it. I do think the foil will be the best long-term investment given the Expedition effect being in play with Aether Revolt cards. If Yahenni dodges reprints in 2019, I could see the foil getting to $5, but I don’t envision it going up enough to profit unless it breaks through in another format. While I am thrilled that the Rakdos guild got some new support, I am skeptical that Judith, the Scourge Diva and Rakdos, the Showstopper will cause a meaningful financial impact to relevant cards. I do think that Judith could challenge for the top Rakdos commander in due time, given how unpopular and unsupported the Rakdos guild has been historically. I am generally avoiding speculation around either of these two cards with the exception of Rise of the Dark Realms and Yahenni, Undying Partisan. The reason I like both of these is because of their dual-purpose serving other similar strategies that Teysa Karlov (and other reanimation/aristocrat strategies) might employ. What do you think? Do you agree/disagree that Judith and/or Rakdos will make waves in EDH? Why or why not? Please feel free to DM me on Twitter (@ChiStyleGaming) or in the QS Discord (@Chris Martin#5133) with your feedback! I always love hearing from you! As always, see you on the battlefield!